Polymeric surfacing is commonly used in the UK for the installation of a range of sports facilities including tennis courts, athletics tracks and multi use games areas as the EPDM rubber surface provides good ball bounce capabilities and can be painted with anti slip coatings in a variety of colours to enhance the safety and aesthetics of the facility. 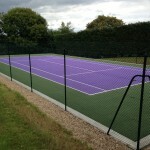 When you have one of these sports courts or athletics tracks built, it’s vital that you choose polymeric surface suppliers and installers who can give you the best performance characteristics for the sports you choose to play, whether it’s tennis, basketball, netball or athletics events including running and long jump. Doing a background check on the polymeric surface suppliers and contractors who are carrying out the works will give you the confidence that they are experienced specialists in the sport surfacing industry. As polymeric surface suppliers we can install top quality sports court facilities for schools and clubs throughout the UK, as well as providing extra equipment for maintenance to keep the court of track in top condition, and accessories such as floodlights and fencing in a range of heights from 3m-5m. We aim to give every client a great quality service at a flexible and good value price to help each organisation fit within their budget requirements. If you’d like to find out more about the polymeric surfacing sports facilities we install and the other services we provide, please take a look around the rest of our website where you can find details of specifications, construction and maintenance. If you’d like some advice about sport surfacing installations or you want to send us an enquiry, please fill in our contact form with as much detail as possible and we’ll get back to you with some helpful information regarding costs and quotes.